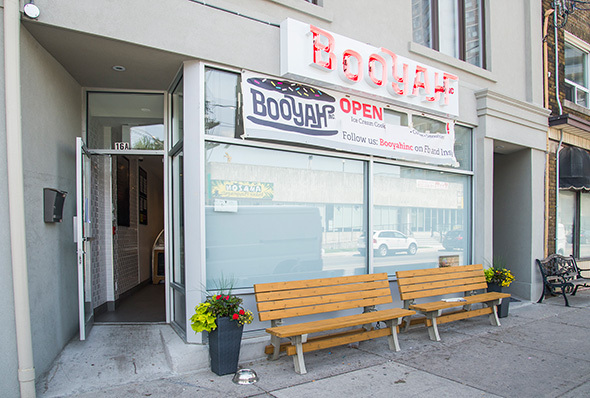 Booyah occupies a retail storefront on Vaughan Road just a few doors down from Dutch Dreams , and it couldn't be more different from its neighbour. 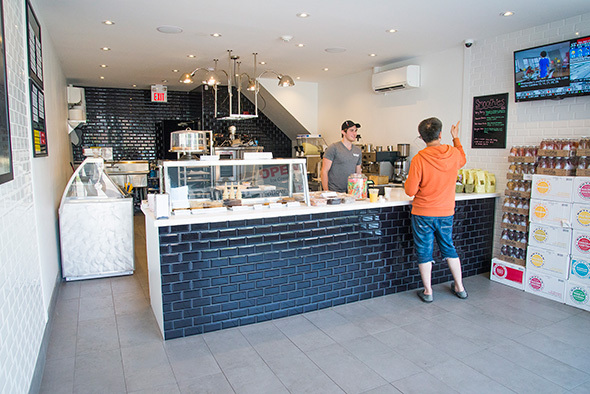 Owned and operated by the Mincer family, this ice cream outlet is sleek and modern. Unlike its kitschy counterpart, this place is spacious and attractively minimal. Bench seating runs the width of the shop inside and out, but aside from that, it's standing room only. The ice cream is brought in primarily from Kawartha Dairy, while select flavours like roasted marshmallow come from Ed's Real Scoop . There are even a couple of dairy free options, though the selection is limited to chocolate and vanilla. Scoops in a cup or cone ($2.75/kiddie, $4.05/regular, $5.75/large) are on offer, of course, but ice cream sandwiches are de rigueur these days, and this is the shop's specialty. 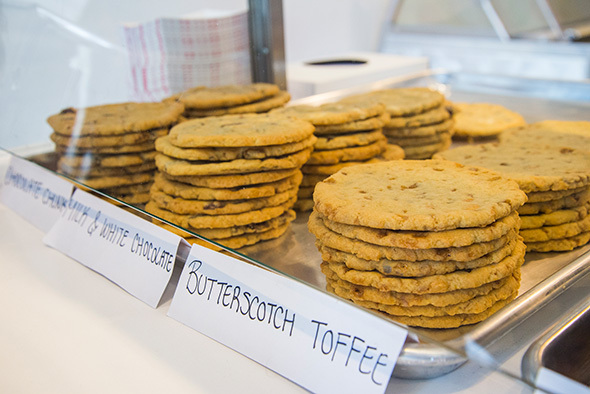 Sold in halves ($4.65) or whole ($7.10), the customizable ice cream sandwiches can be crafted from any two scoops from the 26 ice cream flavours in stock, on a choice of seven different house baked cookies, or a vegan and gluten-free option from Bunner's . 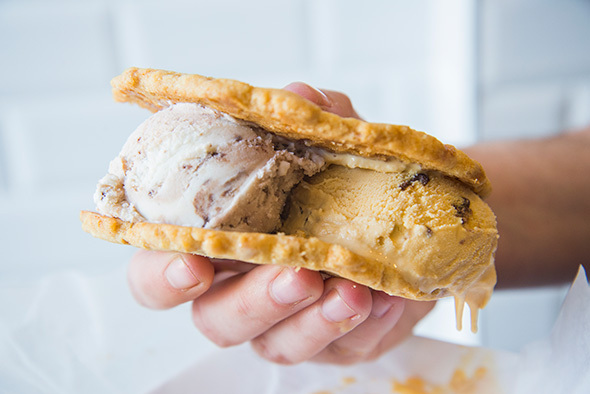 On recommendation I try the most popular combination featuring a butterscotch toffee cookie folded around one scoop of caramel sea salt and another scoop of Wolf Paw, a vanilla ice cream speckled with chunks of fudge and brownies. 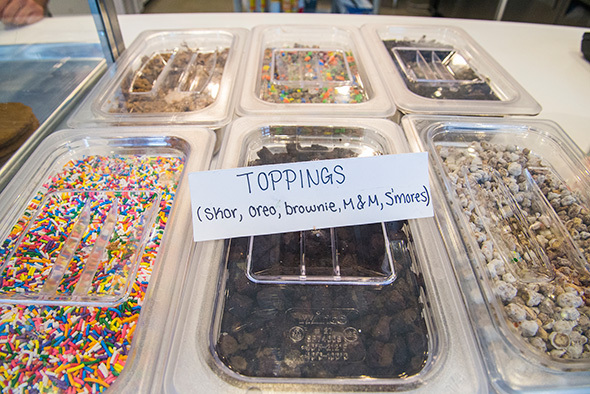 Extra toppings can be added for 60Â˘ more. Slushies ($2.75-$3.50) in flavours like frozen lemonade and French vanilla are available too. 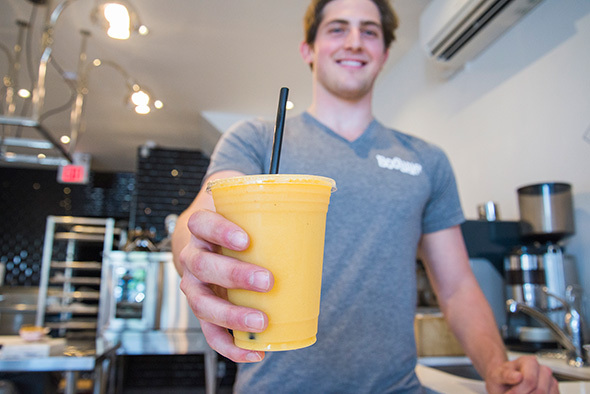 And then there are dairy-free, fruit smoothies ($6) in flavours like the Hawaiian Breeze with mango, peach, banana, and coconut water, or the Very Berry made with almond milk. The neighbourhood response has already been positive, as both Booyah and Dutch Dreams go head to head, each sporting healthy line ups in the evenings.